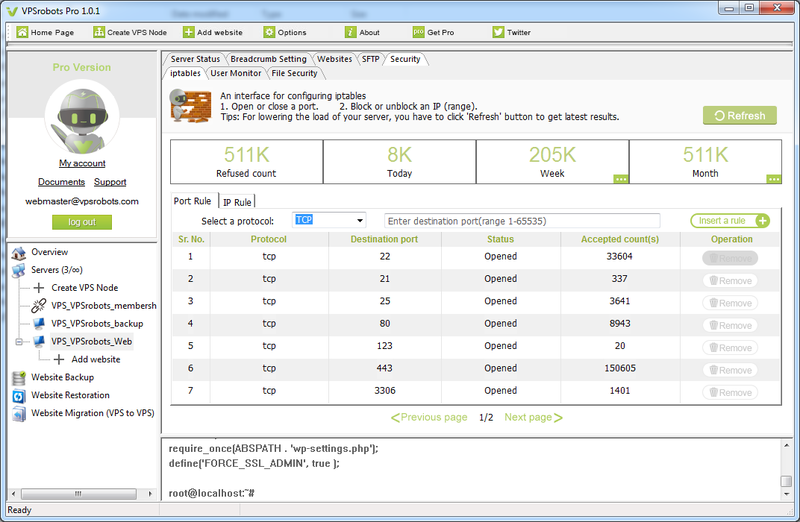 If you’re looking for a more efficient way to manage multiple VPS accounts then VPSrobots should be on your shortlist. As you’ll see in our hands-on VPSrobots reviews, this desktop software lets you remotely manage Linux VPSs through a GUI via SSH. That’s not all though, as this software has some other very useful features. We’ll cover exactly what that means and how this all works in detail in our VPSrobots review. However, if you are looking after more than one VPS this could be a tool to make your life easier. If that sounds interesting to you, read on to find out more. What is the VPSrobots software? VPSrobots is a light-weight desktop software application that runs on Windows. After installing the software, you’ll be able to remotely manage multiple Linux virtual private servers (VPS) through a graphical user interface (GUI) via the SSH protocol. This means you’ll have one locally installed application on your computer to log into. After that, you can add and manage your accounts from one central location. Manage unlimited VPS accounts through a single dashboard. Quickly deploy new websites in a few seconds with no limits on quantity. Create website backup schedules and carry out restorations through the software. Migrate from one VPS account to another using the time saving one-click tool. If those sounds like features that could improve your workflow, keep reading for our full VPSrobots review. By the end, you’ll know exactly whether this is the right software for you and if it’s worth your money. Who is the VPSrobots Software For? If you’re managing multiple VPS accounts and websites, then VPSrobots was created for you. Maybe you’re a hobbyist who runs a few blogs that are hosted on VPS accounts. Perhaps you’re managing multiple websites as part of your job, whether you’re working from home or in a small office. Even those who are managing a large number of websites or VPS hosting accounts could make great use of VPSrobots. There really is no limit to how many sites and accounts you can manage with VPSrobots. Everything is managed through one instance of the software. Instead of having multiple accounts to keep active, or being forced to search through different tabs to find the right window, you can simply have the VPSrobots app running on your computer. Then you can access all of your VPS accounts through one central location, saving you both time and effort. In short, if you’re looking for a way to manage unlimited VPS accounts through a single software dashboard VPSrobots could be for you. To find out what else this tool can do, read on for the rest of our VPSrobots review. As you have seen so far, the main benefits of using VPSrobots are based on its time and effort saving features. Let’s dive into the core aspects of VPSrobots to help you decide if this is the right tool for you. 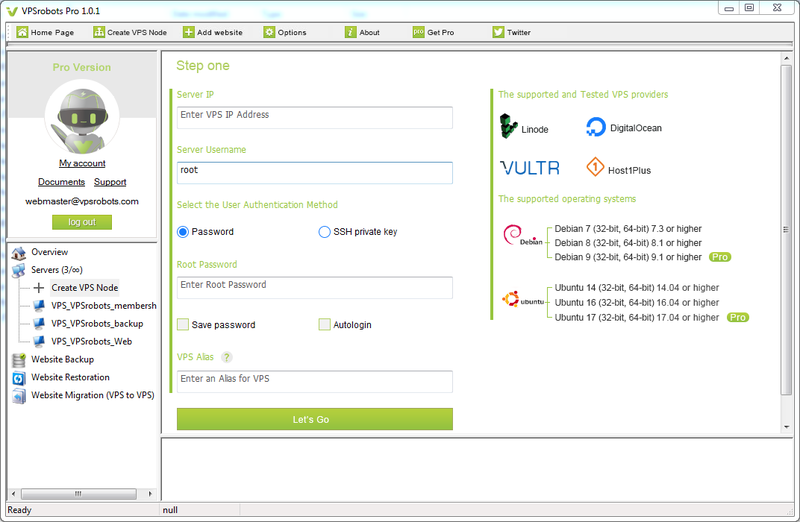 As mentioned, VPSrobots lets you enter the account details for multiple VPS accounts. You can then save those account details in the VPSrobots Windows desktop software. When it comes to accessing your server you have to two main options for logging in to your account. One option is using the username and password, while the other is the more secure private and public key combination. This helpfully gives you the ability to access those accounts through one central location, right on your desktop. Rather than having to remember all of your account URLs and login details, not to mention having to stay logged into your accounts to keep the windows alive, you can just use the VPSrobots software instead. As well as the account management features, another benefit of VPSrobots is the ability to manage your hosted websites. The quantity of website displayed per page can be modified, which means you can have up to 15 websites managed on each single page. Websites can be enabled, removed, even configured with an SSL certificate with one or few clicks in a user-friendly panel. 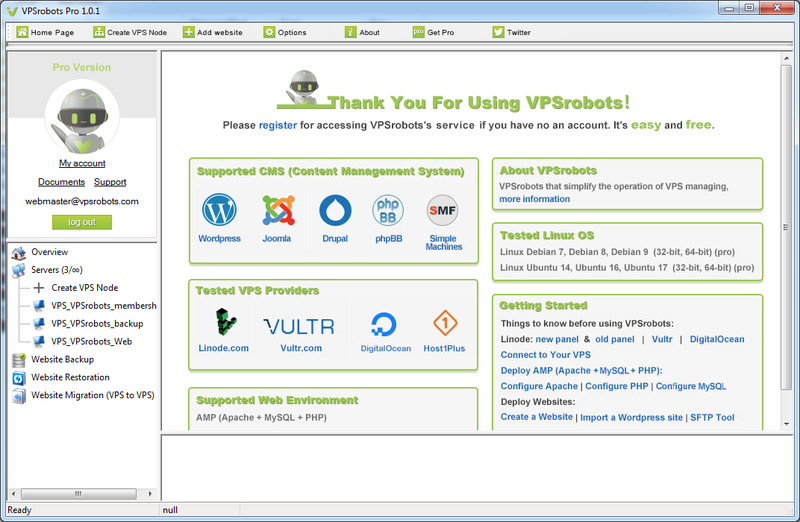 VPSrobots works with any host running Debian and Ubuntu. Thanks to this, you shouldn’t be restricted when it comes to using a VPS host with this software. However, if you are just starting out the VPSrobots software team recommend a handful of companies for maximum compatibility. This includes Linode, DigitalOcean, Vultr and Host1Plus VPS providers who are recommended for their ease of use with this software. For example, as the VPSrobots documentation covers exactly how to manage these accounts with this software, getting started is easy. Therefore, if you haven’t chosen a hosting partner already, then these VPS providers could help you benefit most from VPSrobots. With VPSrobots you can quickly see the status of the accounts you are managing through the desktop software. Simply navigate to the appropriate section of your dashboard to see the status. Examples of the information can see includes the server disk and memory information as well as the LAMP status. You can also view the utilization of the CPU cores and the occupied processes information. This is all useful as it gives you an easy way to check the status of multiple VPS accounts. In turn, this feature can help you take preemptive action when necessary as well as diagnose problems once they’ve arisen. If you are looking after multiple VPS, especially for other people, such as your clients, this feature should be appealing. Once you’ve added your details to VPSrobots, you have the option of quickly deploying a website to your VPS account. If you need to deploy a custom website configuration for testing or demonstration purposes, VPSrobots makes it very easy to recreate your site. 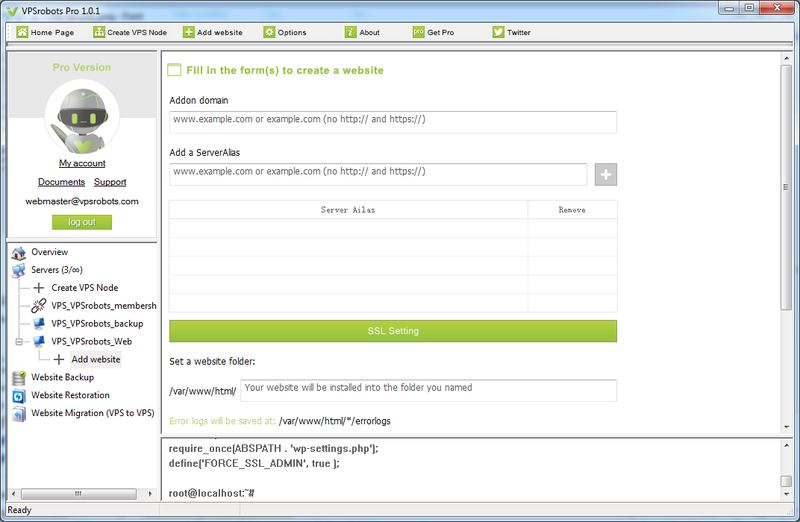 You can also use the VPSrobots sFTP tool to upload files to your servers. This can really simplify the process of transferring files to and from your computer to the server space. The support for compressing and uncompressing files should come in handy too, especially for anyone uploading WordPress themes and plugins. Now you can upload to multiple servers through one app, rather than having multiple windows running or repeating the steps. Websites backups are another feature of VPSrobots that all users should appreciate. Everyone knows how important website backups are. But how many of us have bullet-proof backup solutions in place? Despite our best efforts, it can be hard to implement and maintain effective website backup solutions. But with VPSrobots, this essential task is simplified, hopefully encouraging more users to keep their websites securely backed up for the inevitable issue that demands a restore. Backup files can be stored on or offline. This gives you both easy access to your files as well as improving your options for safe storage. Restoration is also taken care of with VPSrobots. Thanks to this you’ll never need to worry about whether your backups can be relied upon when the time comes. For most of users, website migration is always a real headache, as it requires expertise alongside a long implementation process, while what is worse is probably that there is still not a real practical and accessible solution to it. Things will be totally different with VPSrobots, the amazing design decides the easy implementation. With VPSrobots, to migrate your websites from a VPS to another is just like to choose and play your favorite movies on your PC. which is one of the brightest features on VPSrobots. When it comes to site security, VPSrobots has a few other useful features on its list. One example is the IP tables configuration functionality. This feature lets you see which IPs are scanning your servers and add individual IP addresses to a ban list. You can also use the user monitor module to keep your sites secure with the VPSrobots desktop software. User login records are kept, including the time and date, so you can see who has accessed your accounts. Hopefully, this will give you the ability to spot any suspicious looking access and activity. Core file scanning is another interesting security feature of VPSrobots that’s worth mentioning. As part of the above functionality of VPSrobots, you can use these features with the five most popular Content Management Systems (CMS). This list includes WordPress, Joomla, Drupal, phpBB, and Simple Machines, giving you the ability to quickly deploy your websites with this software. This software compatibility should give you the ability to create and manage almost any type of website. There’s also the ability to help you to configure an SSL certificate for your website. Thanks to this, you can keep your website secure, demonstrate to your site visitors you care about security, and keep search engines like Google happy. As an alternative to web-based hosting control panels, VPSrobots has a surprisingly low impact on system resource usage. Being a plug-and-play desktop-based software application, VPSrobots consumes less memory and CPU resources when compared to traditional web-hosting control panels. This should have less impact on your system and deliver a smoother working experience. Whether you’re time rich and cash poor or looking for ways to free up your resources to work on other tasks, VPSrobots should appeal. Being able to manage all your VPS account on one dashboard, removing the need to juggle multiple control panels, is the main highlight of the VPSrobots project. Instead of learning and staying up to date with multiple systems and user interfaces, VPSrobots brings a uniform user experience to managing multiple VPS accounts and environments. Whether you’ll be using this software yourself or providing it for your webmasters or other staff, this is definitely a positive feature of this app. In fact, the main benefit of using this VPS account management software is the time and money it can save you and your team as well as the convenience it can provide. These are really the main reasons why this software was created. So with that in mind, if you are looking for ways to improve your workflow, save time, or keep your costs down, VPSrobots should be of interest. VPSrobots aims to be the most economical way to manage multiple servers and this is reflected in the pricing options. Unlike other similar tools that charge for each VPS you want to manage, the full version of VPSrobots supports unlimited server management. There’s also a free plan that you can use to try out the software and see if it’s the right tool for your needs. Free plan: manage one VPS with limited features of VPSrobots. Basic plan: $29 per year for up to 2 servers management and access to all features. Personal plan: $49 per year for up to 10 servers management and access to all features. Pro plan: $99 per year for unlimited server management and access to all features. While your VPSrobots subscription is active, you’ll receive product updates and access to the support helpdesk. Thanks to the 30-day money back guarantee if you’re not happy with VPSrobots you can easily get a full refund. You can view the full details of the VPSrobots pricing information on this page. As you can see, VPSrobots should appeal to anyone with more than one VPS account to manage. Being able to download a single piece of desktop software to your Windows computer that gives you the ability to manage multiple VPS accounts is sure to save you time and effort. 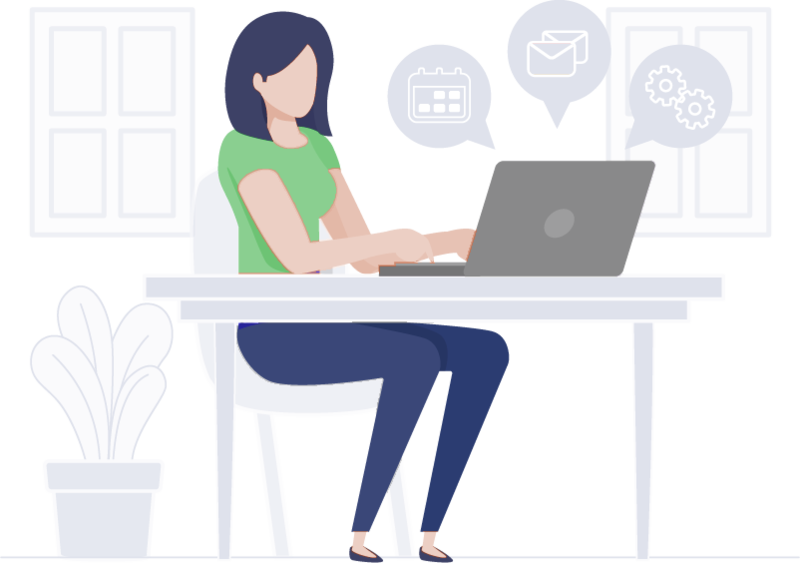 Not only that, but as this software has lots of other useful features, including backup tools, site migration, and security elements to name just a few, it can actually help you improve your ability to manage your websites and VPS accounts. There’s also lots of useful support documentation on the VPSrobots website which will walk you through all the features of this tool. Premium users can access the help desk for individual support from the VPSrobots team. Thanks to the free limited version of VPSrobots you can quickly download and try out this tool today. There’s also the 30-day money back guarantee, allowing you to experience the full set of VPSrobots features, risk-free. Are you ready to sign up with VPSrobots? Have any questions about this service? Please share your thoughts in the comments below.